The objective of the club is to promote and advance the game of Lawn Bowls by providing and maintaining facilities and amenities for playing the game. The club facilitates and encourages social activities amongst members. We have a membership of 78 and are a sub-section of one of the most active sports club in Pretoria. Founded in 1963 the bowls club facilities include two top class bowling greens and a spacious and well-equipped clubhouse. We have social games on Wednesdays and Saturdays starting at 13h30 during the winter months (May to August) and 14h00 for the rest of the year and on Sunday mornings at 09:00. Club attire or plain whites are compulsory on Saturdays. Fridays we are also open for practice or social sessions by members. Smart casual sport clothes may be worn to any session except as specified for the social games on Saturdays. Formal bowling shoes must be worn at all times. 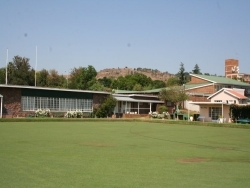 The club is affiliated to Bowls Gauteng North and has men’s league teams represented in Divisions 1, 2 and 5 with the ladies competing in Divisions 2 and 4. Our pub is also open on Friday evenings until 21:00 hours. We invite prospective members to visit us, and if they like what they see, to consider joining our club. Our club is one of the most financially stable. Our membership fees are of the lowest in Pretoria and we have excellent facilities. Our clubhouse continues to evolve after an upgrade in 2011 and our bar is one of the friendliest in town. Our hall in which club functions are held can accommodate up to 80 people, and is also available for rent to the public for special occasions such as wedding anniversaries, birthday celebrations etc. Should anyone be interested in hiring the facility they can contact our President for further discussions regarding fees etc. Corporate entities can also consider having fun days, team building, Christmas parties etc. by combining the use of our excellent bowling facilities followed by a party in our hall. We can always arrange to have bowls available for those who have not played the game before. We look forward to any further queries from anyone who may be intersted in contacting us with regard to the above mentioned at any time.